If you are looking for a big screen TV that does not burn a hole in your pocket and has a good picture quality, then Vu 65 inches 4k HDR 10 is a TV that you should definitely consider. In this article, I'll be reviewing LTDN65XT800XWAU3D, version: 2017. However, both 55-inch and 65 inch models of this series have same features and specifications, the only difference lies in the sound output of the two. 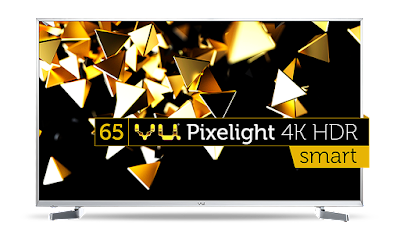 This Vu 65 inches 4k LED TV has an aluminium frame ultra-slim bezel that imparts a premium look to this TV. The rear of this TV has a self-designed black plastic finish that does not look cheap at all. The back side of this TV is a bit thick as it has DLED backlighting that needs space to accommodate the LED alignment. This TV comes with 4 HDMI and 3 USB ports. Out of these, all 3 USB and 2 HDMI ports fall on the side, which makes it quite convenient to use them. You get both HDMI CEC and ARC ports in this TV. The CEC port allows you to operate all devices connected to this TV through a single remote and through the ARC HDMI port you can connect your audio devices to this TV. The SPDIF optical port allows you to connect your music system for a more enhanced audio experience. Not only is the remote premium in looks with a chrome lining running all around its edges, it has many convenient features on it. It gets direct buttons to YouTube, Netflix, Media and also for browsing its smart feature. It also has direct buttons to the picture and sound quality along with one for Liv TV. The TV takes very less time to boot and the Smart Vu TV branding greets you on opening. Both 65 as well as 55 inches TVs of this series come with 4k HDR 10, 10-bit VA, A+ grade panel. As it is a DLED TV that comes with local dimming and VA A+ grade panel, the black levels are pretty good and uniformly distributed all over the screen. The colour reproduction of this TV is accurate and you don't get overly saturated images. I found the details in this TV better than the previous Iconium series and even the Limited Edition Premium UHD 65 inches 4k TVs that came with Edge-lit backlighting. According to the company, this TV has a wide color gamut and a brightness of 450 Nits. Though, the refresh rate of this TV is less at 50 Hz, it showed no visible lag during sports or action scenes. The company has incorporated an Ultra Smooth Motion rate in this TV that does make up for the lower refresh rate to some extent. However, if you are a gamer, who is looking forward to playing high end games on this TV, I would suggest you to go with Sony that has a refresh rate of 200 Hz. In the internal settings, you even get an on/off switch for ultra-smooth motion rate. A single push of the Media button on the remote, gives you access to pen-drive and its content. The subtitle button on this remote is a very convenient feature for all those who watch movies in foreign languages. Without the hassle of entering the TV settings all the time, you can adjust settings directly from the mere click of this button. This TV gives you the option to display subtitles in different font sizes at three different levels on the screen. The TV has an option for dual audio too. The Exit button on the remote brings you back directly to the TV channel that you were watching before diving into the Media. Through a mere push of a button on the remote, you can browse the smart features of the TV along with watching the channels through your set-top box. The picture upscaling of this TV is pretty good. You can save Internet data by downloading movies in low resolution and subsequently enjoying them on this TV in high resolution. The good thing about this TV is that videos get resumed from where you left. This feature comes handy especially during power cuts. This TV also rids you off the cumbersome process where you needed to fast forward or reverse scenes by going through the different speed levels of a TV. Just by pushing the right and left navigation buttons you can see your favourite scene at the blink of an eye. To test whether this TV had true 4k HDR 10 functionality along with a 10-bit panel, we downloaded some videos through Chrome browser from a site that provides large sized files of all formats without compressing them. The videos that we download from YouTube for testing are compressed ones that are ineffective in allowing you a quality check of your TV with precision. Initially, we tested this TV by playing an mp4 4k HDR 10 video of LG @ 60 fps, which is especially made for only those TVs that have 10-bit panel with 4k HDR 10 feature. The TV passed this test successfully as the video played beautifully without any lag. Videos in mkv format too played smoothly on it. However, when I tried playing a WebM file downloaded from YouTube, this TV did not support it. Here, I would like to mention that this file went unsupported in LG 4k HDR TV too and Sony played only the video, skipping the audio. Only Samsung played it without any lag. However, when I downloaded another uncompressed WebM file from the Internet and played it through USB on this TV, it played beautifully. HD channels, when played through a TataSky set-top box on this TV, turned up pretty well with nice contrast, rightly saturated colours and clear details. The normal channels too, looked good on this TV. The pictures were pretty clear and did not appear distorted. The viewing angle of this TV is pretty decent and the picture does not gets washed off when watched from extreme angles. Now, coming to its audio. This TV has been graced by 2-speakers that give a total sound output of 30 watts. In the 55-inch model you get a sound output of 24 Watts. The audio of this TV gets a boost through, Dolby Digital, Total Sonics, Total Surround and DBX. If you set the equalizer of this TV to its perfect settings along with some other internal settings, you'll get to hear a loud and clear audio that does not require any external audio enhancement system. I found the sound quality of Limited Edition Premium UHD TV better than the Iconium Series, and, this TV surpasses even that TV in sound quality. This TV comes with Miracast feature and casting your phone to the big screen is lag-free. The company has even given PC casting feature in this model, but it depends on the hardware and software of your laptop or PC, whether they support casting or not. My Asus Laptop and MacBook Air both did not support this feature, so I was unable cast them to this TV. Maybe, your latest PCs or laptops have this inbuilt casting feature. The only field where it lags, is smartness. This TV is only Opera Smart, which means you cannot download apps from the play-store, even side-loading will not work here. There is no Bluetooth provision in this TV, which is a big let-down. However, in this TV, you get the option of streaming YouTube and Netflix videos in 4k. But, for that you require high speed Internet data. You also get an Opera browser in this TV. Amazon Prime videos go missing on this TV, which might not appeal to many, who have a special liking to these videos. However, if you are not happy with the smartness that this TV offers, you can complement it with a good 4k Android TV box and make it a complete package. To watch the video review of this TV click here. Is it possible to see primevideo.com in Opera browser on this TV as there is not Amazon prime app?